WWE's last PPV of 2016 is available on DVD now from all reputable home video stockists and we've got the full details of what's included in a snappy review! A RAW branded event , Roadblock: End of the Line 2016 saw the likes of Chris Jericho, Cesaro, Seth Rollins, Kevin Owens and Roman Reigns in action, multiple titles changes hands and a 30 Minute Iron Man Match, but was it any good? Let's take a look. The best match of the three hours comes first as The New Day's Big E & Kofi Kingston defend their record-breaking RAW Tag Team title run against Cesaro & Sheamus, with the five (incl. Xavier Woods on the outside) fitting a lot of exciting content and a barrel load of near fulls into just ten minutes. Sami Zayn attempting to last ten minutes with Braun Strowman is intriguing on paper, but doesn't quite come together in practice, despite a wonderfully melodramatic babyface performance from Zayn. Seth Rollins v Chris Jericho is a match that you would perhaps label as a show-stealer when looking at the line-up, but unfortunately the duos work here is uninspiring, lacking in tension and anything remotely interesting until the last few minutes. Of course, Rollins and Jericho are both premier technicians, so the wrestling doesn't really put a foot wrong, but there's definitely a sense of the two treading water for fifteen minutes before Kevin Owens makes his inevitable appearance. A three-way Cruiserweight title clash between champion Rich Swann and challengers The Brian Kendrick and TJ Perkins is patchy at best, with the three struggling to hit their marks, although it's worth sticking round post-match for the return of Neville. The RAW Women's Championship 30 Minute Iron Man match between Sasha Banks and Charlotte Flair is a rewarding experience for anyone willing to stay with the match after an unspectacular start. The second half of the match is brilliantly theatrical, with a pair of top draw performances that make it difficult not to be drawn in. The story twists and turns, keeping clear of a couple of cliches and feeling much more like a sports-based presentation than some of WWE's previous Iron Man efforts. It perhaps wasn't the strongest outing for Banks and Flair throughout the year, but it does cap off their feud rather well...for now. The show-closer comes in the shape of United States Champion Roman Reigns getting a shot at Kevin Owens' Universal Championship in a long-winded plodding encounter. The contest suffers in a similar way to Rollins v Jericho, seemingly waiting for the right moment to get going, without ever actually reaching that moment, producing just enough to hold your attention but rarely rewarding you for sticking out the 23 minutes. The finish is unacceptable for such a lengthy match, even if Chris Jericho and Seth Rollins' reappearance does end the event as a whole on a high. The single special feature is the Kick-Off match, Big Cass v Rusev, which quite honestly might as well have been left off the release, it's a dull brawl with another shoddy finish. 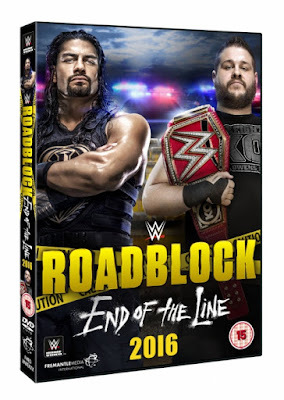 One of the weaker PPVs of 2016, Roadblock: End of the Line 2016 is littered with hackneyed booking and lacklustre performances. The opener over the RAW Tag Team titles is the best match on display, closely followed by the Charlotte Flair and Sasha Banks' Iron Man Match. Looking at the card, it's difficult to argue against their being a degree of unfulfilled potential with the show, considering that Rollins v Jericho should have been a humdinger and Reigns and Owens had a much better match just a month later at Royal Rumble.